Once you again you have outdone yourself. Your music seems to have brought a new light into your life, it has touched you and has of course touched all of us in so many ways. You say you "got out of the way" to write this music, but there seems to be so much of you in this music, in some way or another. I have seen you all over the world, from places such as Chile where you songs such as "They Dance Alone" was more than just a song. It was a rallying cry against a harsh long-term dictator Pinochet, whom you named directly in that song. You music was banned in Chile at that time, but the power of your music made a huge change in that country. I have also seen you in many other venues around the U.S. and around the globe over the years. NYC and the "Last Ship" was simply magical and a type of rebirth of wondrous music that still amazes me. I have followed you for years and I always wonder, "What's next" and you never cease to amaze all of us. I cannot wait to see what comes next. - Daniel, Santiago, Chile and Washington D.C.
You see, "the birthday boy's decided to hold a celebration!" And whatever we thought, we'd be overcome. When the Last Ship Sailed. Wonderful Andy!! you are perfectly right!! ... In heaven haviing such fun!! I can perfectly imagine.... Ciao Paola! Thanks eveyone for their wonderful insight of what it ment to them to be so fortunate to be there ,thank you so much.....PS.......Andy......brilliant piece of work in your comment....well done ,Amazing. 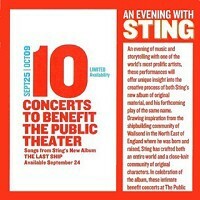 Both Sting and our stellar fan site members. ALL lovely letters. Well said. Thank you for sharing. My 80+ mom is thrilled with the songs. And is curious about the love interest more than the story. i Told her I hadn't a clue. If you.need her demographic feedback let me know :) I couldn't figure out why Oct 6 kept haunting me. Oops - Happy Birthday bro. Where did The Ship story go? Saw the "penultimate" concert of the series. Music is awesome. But as a musical theater always struggling with creating through-lines for shows, I'm struck by the fact that the story is floundering. 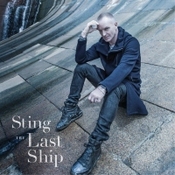 According to Sting, it's the story of the community dealing with the last ship sailing and then coming together on an impossible mythical quest. The opening song conveys that idea. But then, by Sting's own admission, he's really much more interested in telling you about the characters, rather than creating characters are that changed or moved or progress along with the story of the quest. The songs are clever and heartfelt seem like songs from "Working" rather than this mythical quest. Then, Sting admitted he was begrudgingly required to add a love story. Those songs are in their own world, not in the world of the last ship. So...all those 60+ white-haired ladies in the Broadway theater are going to be scratching their heads trying to figure out how these three different thrusts add up to a compelling story. Tell the story you want to tell!